Lopez, D.; Sanchez, F.; Vidal, E.; Pegueroles, J.; Alier, M.; Cabre, J.; Garcia, J.; García, H.
The introduction of sustainability skills into higher education curricula is a natural effect of the increasing importance of sustainability in our daily lives. Topics like green computing, sustainable design or environmental engineering have become part of the knowledge required by today’s engineers. Furthermore, we strongly believe that the introduction of this skill will eventually enable future engineers to develop sustainable products, services and projects. The Final Year Project is the last academic stage facing students and a step towards their future professional engineering projects. As such, it constitutes a rehearsal for their professional future and an ideal opportunity for reflecting on whether their Final Year Project is sustainable or not, and to what extent. It also provides a good tool for reviewing the lessons learned about sustainability during the degree course and for applying them in a holistic and integrated way. In this paper, we present a guide that allows both students and advisors to think carefully about the sustainability of engineering projects, in particular the Final Year Project. The introduction of sustainability skills into higher education curricula is a natural effect of the increasing importance of sustainability in our daily lives. Topics like green computing, sustainable design or environmental engineering have become part of the knowledge required by today’s engineers. Furthermore, we strongly believe that the introduction of this skill will eventually enable future engineers to develop sustainable products, services and projects. The Final Year Project is the last academic stage facing students and a step towards their future professional engineering projects. As such, it constitutes a rehearsal for their professional future and an ideal opportunity for reflecting on whether their Final Year Project is sustainable or not, and to what extent. It also provides a good tool for reviewing the lessons learned about sustainability during the degree course and for applying them in a holistic and integrated way. In this paper, we present a guide that allows both students and advisors to think carefully about the sustainability of engineering projects, in particular the Final Year Project. 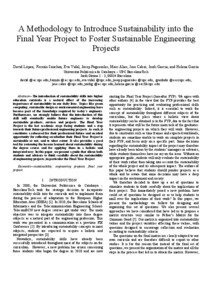 López, D. [et al.]. A methodology to introduce sustainability into the Final Year Project to foster sustainable engineering projects. A: Annual Frontiers in Education Conference. "Frontiers in Education Conference: opening innovations and internationalization in engineering education: october 22-25, 2014, Madrid-Spain: proceedings". Madrid: Institute of Electrical and Electronics Engineers (IEEE), 2014, p. 2360-2366.